Carlyle Dental offers tooth extraction for residents living in Kinston, Goldsboro, Greenville and the surrounding areas of North Carolina. Tooth extraction is a procedure that removes a severely damaged tooth from the mouth, in order to protect surrounding teeth from becoming infected. It is typically only utilized when no other treatment option, such as a root canal therapy, will cure the infection or restore the tooth. Tooth extraction in Kinston, NC and Greenville, NC is commonly implemented for the removal of wisdom teeth, or to make room for a separate orthodontic treatment. Children may have decayed baby teeth removed in order to protect the incoming permanent teeth, or simply if the baby teeth do not fall out in time and threaten to inhibit new growth. Some individuals have extra teeth that block other teeth from coming in, and malformed or impacted teeth may be removed for cosmetic reasons. People who have certain medical conditions, or those undergoing treatment that weakens the immune system may be more susceptible to infection, and may require tooth extraction. Before performing a tooth extraction in Kinston, NC or Greenville, NC, Dr. Carlyle will x-ray the area, and formulate a plan to determine the most effective way to remove the tooth. A simple tooth extraction is generally done with a local anesthetic, but sedation dentistry may also be used, particularly for surgical extractions. A simple extraction is performed through the use of a tool called an elevator, which, along with dental forceps, rock the tooth back and forth until it is loosened. 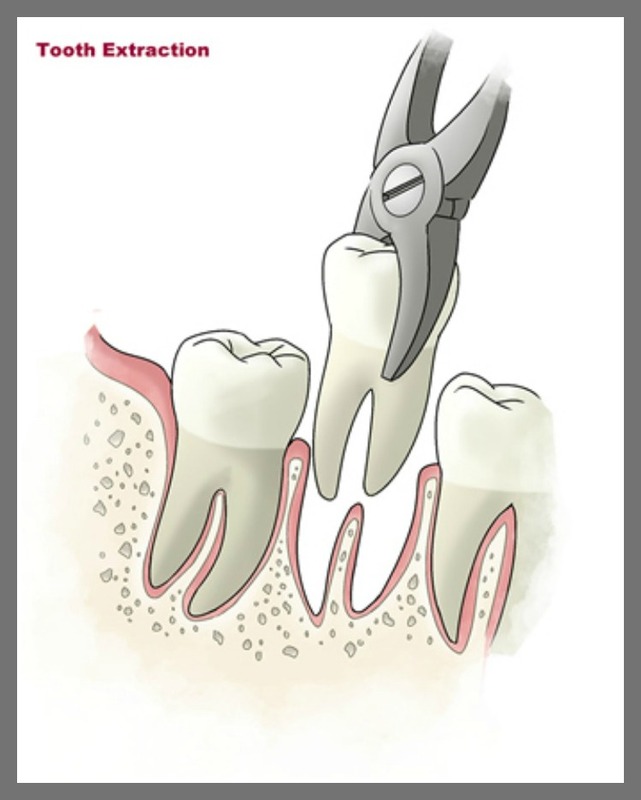 With wisdom teeth extractions, impacted teeth, or with teeth that are not easily accessible, an incision is made. In some cases, the soft tissue and bone covering the tooth are removed, and teeth may be cut into several pieces for ease of extraction. Depending on the location, once the tooth has been removed, stitches may be required. When a tooth is extracted, a blood clot will form in the socket within an hour, and although there is some initial bleeding, it usually stops within 24 hours. Painkillers are sometimes prescribed depending on the severity of the extraction, and Carlyle Dental provides detailed care instructions that will promote quick recovery, usually within a few days. The gap left by tooth extraction can be filled with an implant, a bridge, or a denture. In many cases, such as for wisdom teeth, no replacement is required. Carlyle Dental performs tooth extractions for residents of Kinston, NC and Greenville, NC with gentle and compassionate care. Our goal is to minimize any anxiety you feel, as well as to make you comfortable and pain free. How Much Does Tooth Extraction Cost in Kinston, NC? The cost for tooth extraction varies and depends on the extent of treatment necessary. We accept cash, MasterCard, Visa, and personal checks. Insurance is accepted, and we also have financing available through CareCredit® and Compassionate Healthcare Services®.